Formerly known as Binariang Satellite Systems Sdn Bhd, Measat Satellite Systems Sdn Bhd is the satellite operator in Malaysia. Measat means Malaysia East Asia Satellite and it is the name used for all the communication satellites it operates. The company is led and managed by T Ananda Krishnan or A-K, currently the second richest man in Malaysia. Up to 2006, Measat has launched 3 geostationary satellites namely MEASAT-1, MEASAT-2 AND MEASAT-3 respectively. The first 2 satellites were launched in1 996 and the third one was launched 10 years later. All the satellites were designed and made by Boeing Satellite Systems. In terms of reach and functionality, MEASAT-1 and MEASAT-2 were made to provide direct-to-user television services in Malaysia which is offered through Astro as well as communication services which are offered through Maxis. This would be available for 12 years and it would cover Malaysia to the Philippines and through Beijing to Indonesia. The latest satellite which was launched in 2006 (MEASAT-3) would extend the coverage of the services and to offer better quality of delivery that will cover about 70% of the world’s population but this has been met with some criticisms recently. Most Malaysians are aware that one services provided by Astro are often disrupted during rainfall or storms and MEASAT-3 was publicized to have overcome that problem. This however remains the major problem for subscribers as most are still facing similar problems during bad weather conditions. Hence, with more players in the pay-per-view television market like TM (Telekom Malaysia) and cable television joining the fray, Astro has been under pressure to perform and to regain its customer’s confidence in the near future. 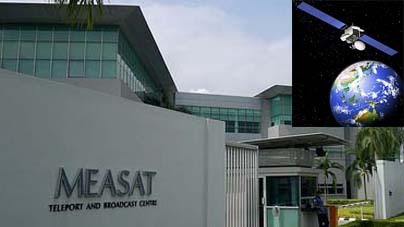 In fact, MEASAT-3 brought high-definition programmes through a larger choice of channels as well as high-speed internet connections to the homes of Malaysians and around the region. In 2009, MEASAT 3B was launched to complement the current fleet while MEASAT-3B is planned to take off in 2013.